Hello dear visitor! We’re so happy you’ve found your way here! Our new post is a long one and begs to be two posts to give the project its due. It did take four months of weekends to complete during the Winter of 2013. It was completed the weekend before our planned college graduation party for one of our sons. We really cut this one close! But, after the many months of work and body aches, it was well worth it as we hope you will agree. It all began with a bookshelf. We wanted a bookshelf. Not just an ordinary bookshelf, but the kind that is built onto the wall. After determining that we could, in fact, build said bookshelf ourselves with our fantastic Kreg K4MS Jig Master System , we started thinking and laying out the project. As is per usual, once the thinking begins, the plans evolve and change and mutate and become monsters where once small projects existed. We can’t help it, we’re dreamers! Take a moment to travel back through time to a previous post that shows the wall I’m talking about. You may notice the short wall that separates the living room area and creates a sort of “hallway” near the other bedroom door and the bathroom. Check it out here. I’ve always disliked this little wall and couldn’t wait for the opportunity to GET RID OF IT! Since this bookshelf was going to sit against a back wall and meet a side wall in the opposite corner, the wall on the side would need to be redone first…as the plan all along had been to do something different with the living room walls. So, the project grew to a wall and a bookshelf. Once we determined we would be redoing the wall, we figured why not build a whole wall of built in bookshelves? And then, why not storage benches under those bookshelves? And then, since we were going to do one wall, why not all of the living room walls AND the ceiling? And then? And then?????? Well my friends, that’s exactly what we did. 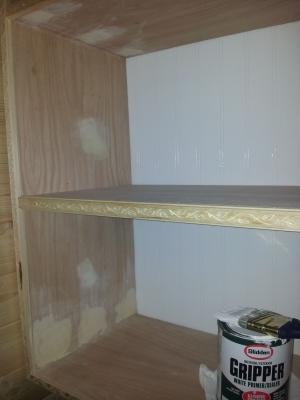 We decided to build our shelves and benches using plywood (smooth birch to cut down on sanding). These were trimmed with our favorite 3/4 inch trim that is etched with a vine pattern. The benches have a three inch baseboard trim that meets a nice three inch flatter wall trim that we used throughout the living room. All of these were built using one of our favorite tools of all time, the Kreg Pocket Hole Jig . We have built so much stuff from bookshelves, to entertainment cabinets, a desk, two beds, you name it, we’ve built it with a ! If you are a DIYer and you do not have a Kreg Jig yet, now is the time. I promise, it will increase your productivity and open up your creativity and confidence in building things for your home. 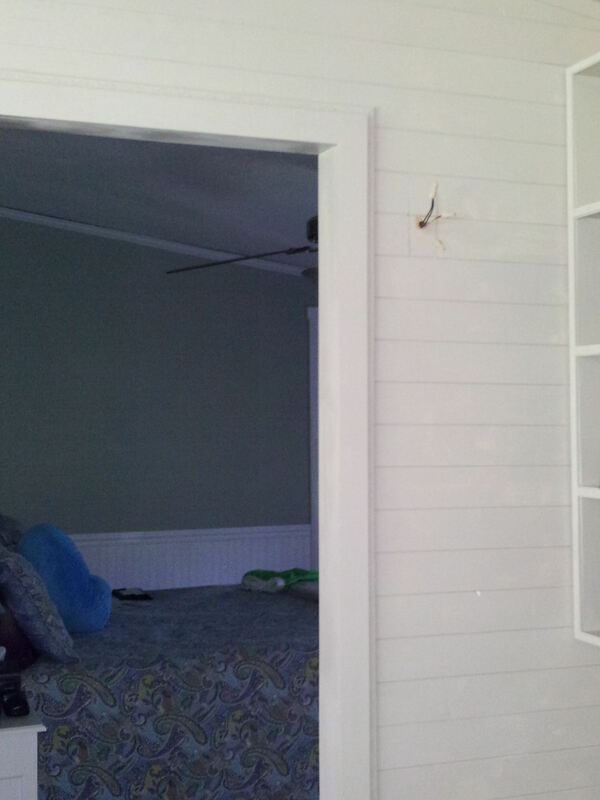 Our wall and ceiling surface of choice is knotty pine tongue and groove found at Lowe’s (image in the gallery below). We also re-wrapped the center beam on the ceiling where the two sections of our home come together. We have disliked this forever and had a ceiling fan mounted there, but had wired it using a round extension cord hard wired into the fan/light and run along the ceiling/wall and plugged in and it looked pretty cheesy bad. This new covering we did allowed us to install a junction box and run the correct wiring so it looks finished and all proper like. To cover the center section we used the same plywood we used for the benches except 1/2 inch rather than 3/4 inch. It really came out beautifully. 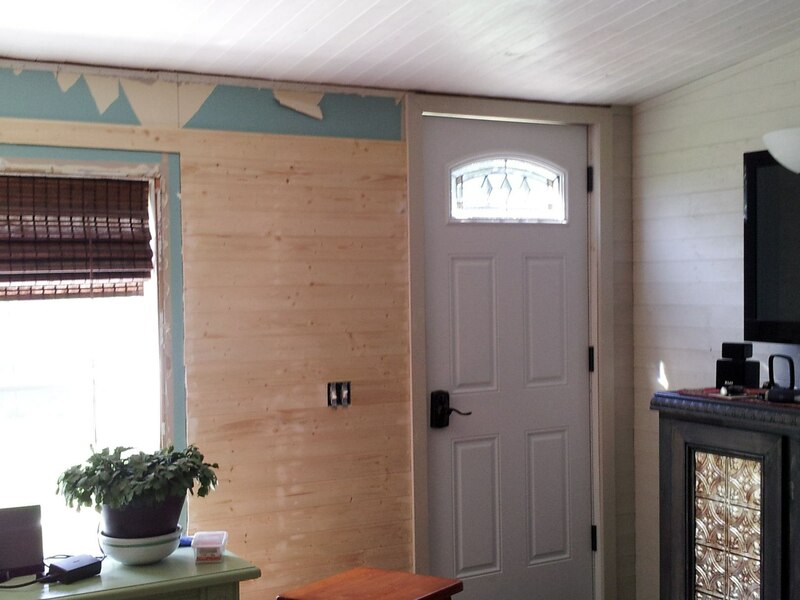 Don’t be discouraged if you do a project with the knotty pine. When you first put it up, all the edges look pretty bad. Once you trim it out, as with any job like this, it will clean it up beautifully and really look nice. 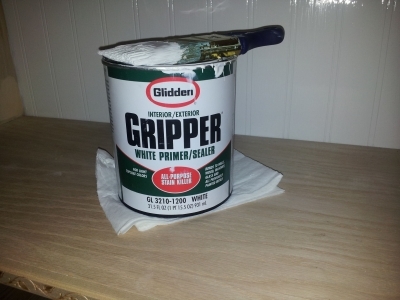 We use Dap 12346 Drydex Spackle Interior Exterior Paste for filling nail holes and smoothing out trim seams and awkward spaces. It goes on pink and dries white. Then, it’s very easy to sand and paint over. However, I didn’t have to sand any of the wall or ceiling holes in this project because I just used the tip of the container to dab the holes and it smoothed them over as I did it. 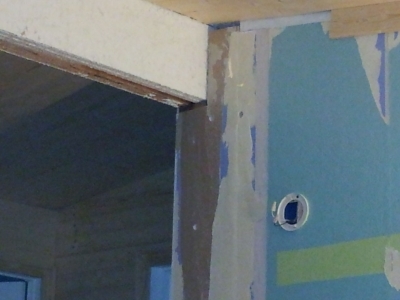 And yes, I did fill EVERY SINGLE NAIL HOLE on the walls and the entire ceiling before painting. 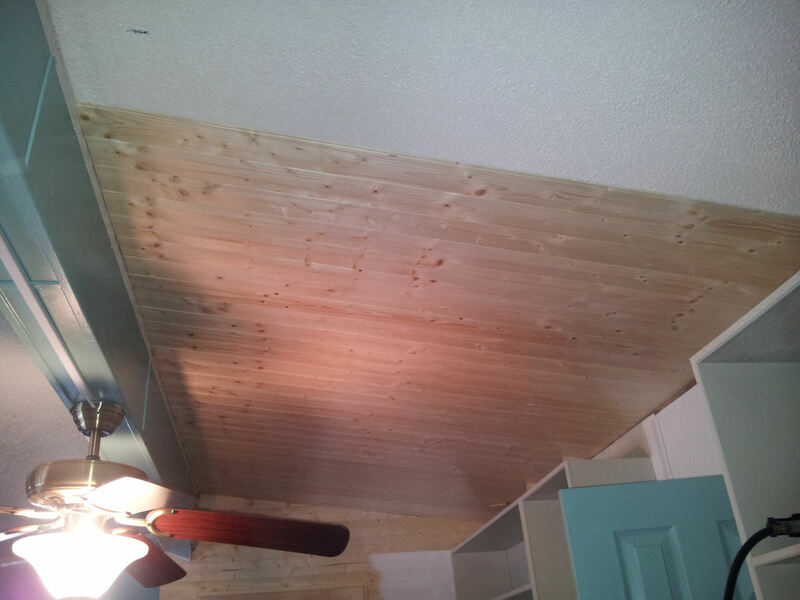 You can’t tell we used a nail gun or nail hole filler at all. We also painted the surface with a satin sheen so there wasn’t a real paint shine and you can still see the wood grain through the paint. 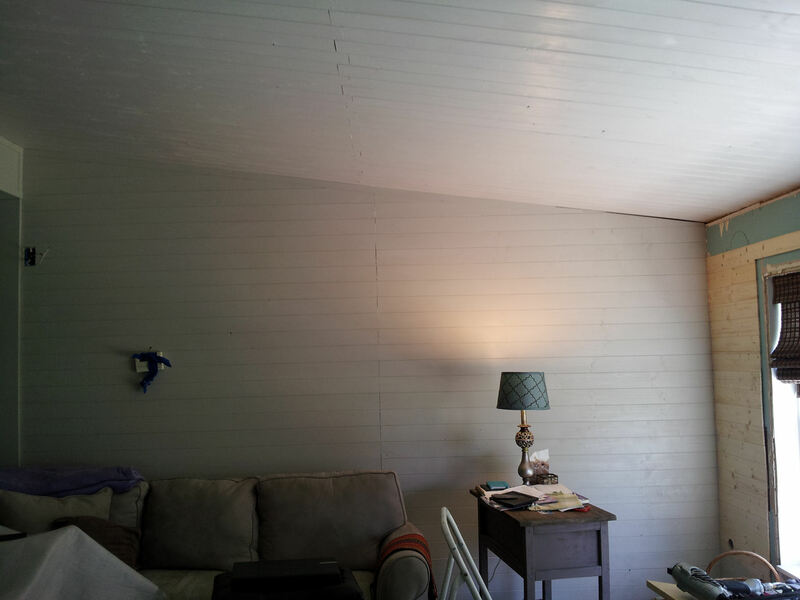 The color for the wall is Valspar “Outlands Subtle Taupe” 6005-1B and the ceiling is one sample lighter “Asiago” 6005-1A, both in Satin finish. These have a silt like tone to them that looks like smooth white wash and they show all of the character of the wood beneath. One of our favorite parts of this project, aside from all of it, is a type of lighting we installed. We will put together a separate post on just this topic. But suffice it to say, it gave me an opportunity to repurpose the annoying “wired” smoke detectors that I’ve always disliked. Please don’t send me hate mail about the importance of having smoke detectors…we have battery powered smoke detectors all over this house! 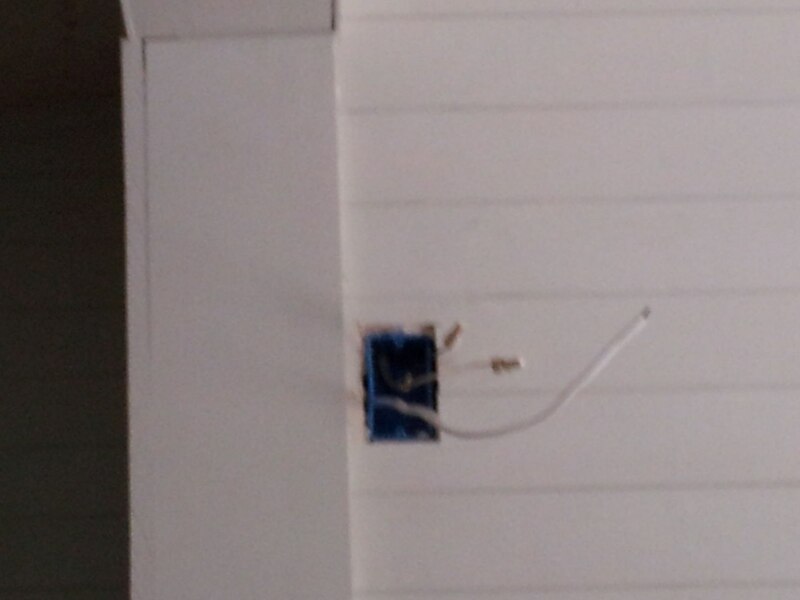 But I have never liked the wired ones so was relieved to come up with an ingenious idea to correct this problem. The following is a gallery of images showing the order of our work. Check out our follow up post for pictures of the finished product. This job took nearly every weekend from January until the second weekend in May to complete give or take 3 or 4, right up until the very first guest arrived for our son’s college graduation party ‘:-)! Phew! We really cut it close. But, it truly feels wonderful to sit in this space among all of our hard work, our memories of the weekends working together, dreaming it up and seeing it through. It truly is a lovely space that feels like home. We began with the back of the living room. We built the shelves, put them up and then began with the walls. 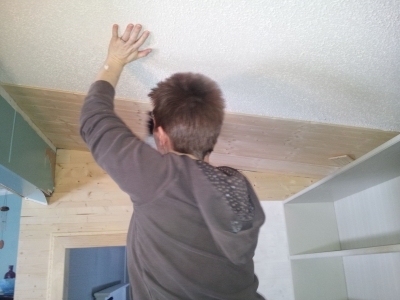 Once the walls were done, we began work on the ceiling. We knew we needed to build new framing around the center beam. Only do this if you are certain you will not need to move your mobile home and put it in a different location. 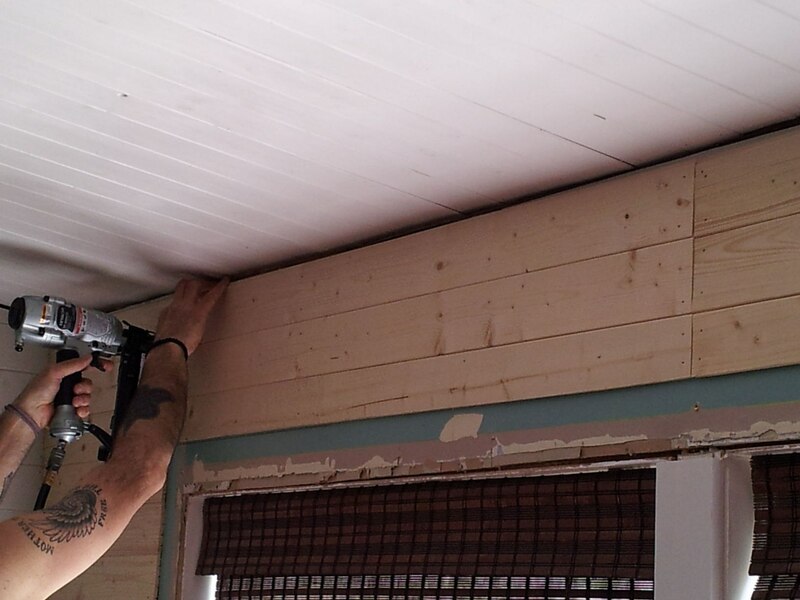 We tore the trim off the walls and prepared to cover with knotty pine. 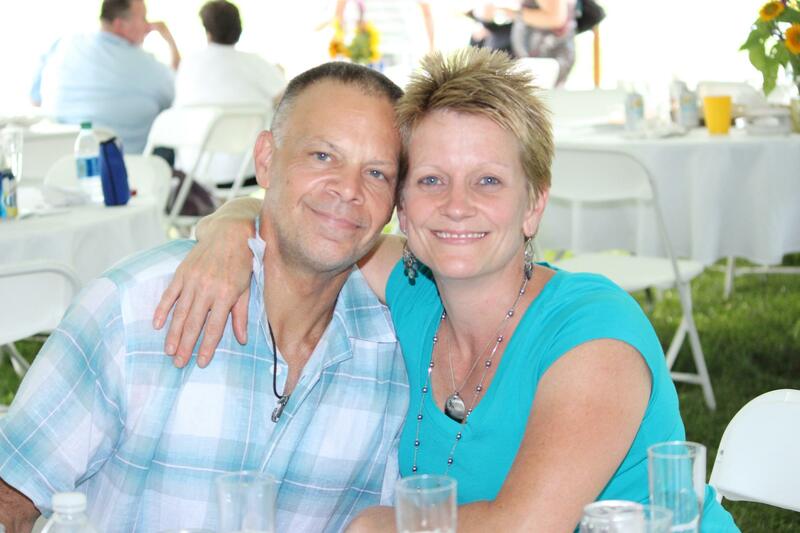 We hope you enjoy these pictures and PLEASE feel free to ask any questions you may have or just comment below. We’d love to help or just hear your feedback. Thanks so much for stopping by! 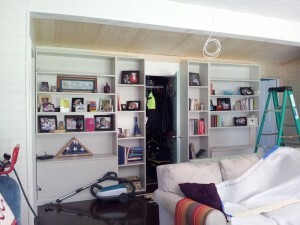 And don’t forget to visit our follow up post Mobile Home Living Room Remodel- The Finale to see the final product. Can I Paint My Mobile Home? Yes I Can! may I ask what you underpinned with ? I was thinking of Hardi siding 4×8 sheets on a 2×4 frame and later doing stack rock. Hi Todd. Thanks for visiting our site! We didn't use strips or anything, we just put the knotty pine boards over the original ceiling and also over the gypsum wallboard. We just made sure to mark where all of the studs were and purposefully nailed the boards into studs under the wall and ceiling material. 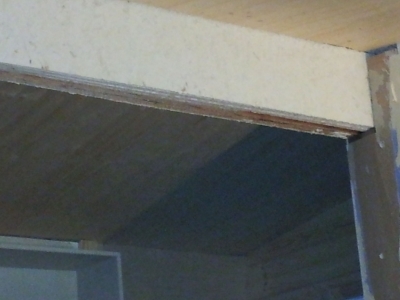 Do you think, there still hope for 1972 old mobile home, it's de registered mobile home, the foundation was not really good, I mean it has a leak everywhere, the insulation is too thin, and it it's really cold now in here. We don't know what is the best, if we gonna stay here and renovate it or just buy a house? Thanks for visiting, Ruth! 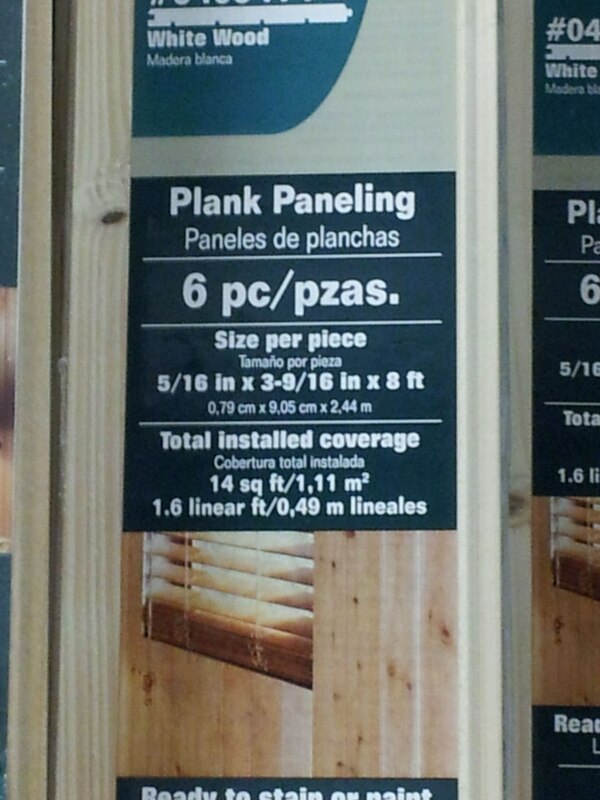 I alou ways believe it is cheaper to remodel than it is to buy new. But, if you can find another used home in good condition, you may have better luck to do that. Are you living in the \’72 home now? If you don\’t owe any money on it, and you\’re living in it now, you could probably do a lot of remodeling pretty inexpensively, even if you just have a chassis and a frame! 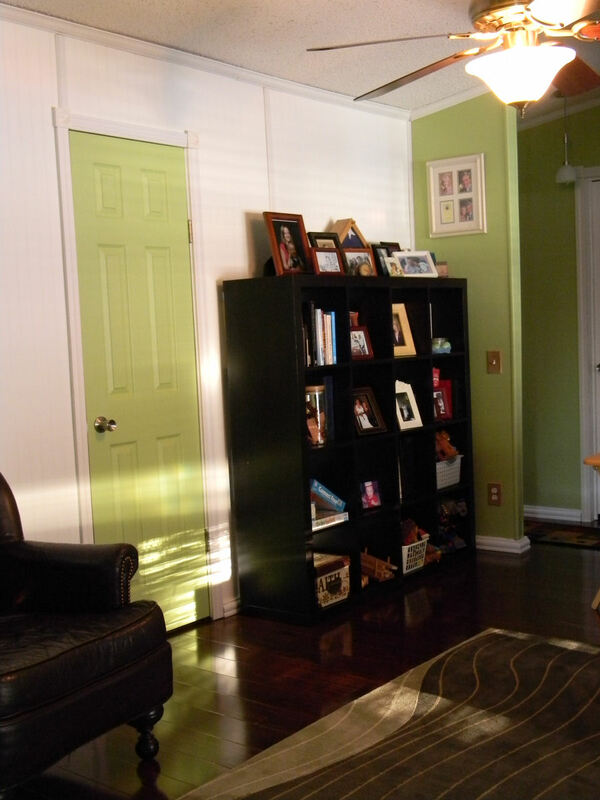 We remodeled our double wide 7 yrs ago- it included recovered walls in 4 rooms, new laminate floors in 5 rooms, a pellet stove and hand built hearth, building a closet in a wall that didn\’t have a closet before, all new windows, sills, and trim, solid hand-made 2×4 and plywood skirting, a new bathroom remodel from a new subfloor up, complete kitchen remodel from the floor up, a new water tank and water heater- and we did all of this for under $20,000. Of course, we did the work ourselves, but we learned a lot in the process! You would be amazed at what you can do if you look for deals and are patient. Some even accomplish this through barter and using good quality used materials that can be refurbished. If you think you want to try and salvage your place, go for it…it will be a lot of work, take a lot of time, but you can do it if you set your mind to it. Be creative and open minded. Good luck to you. 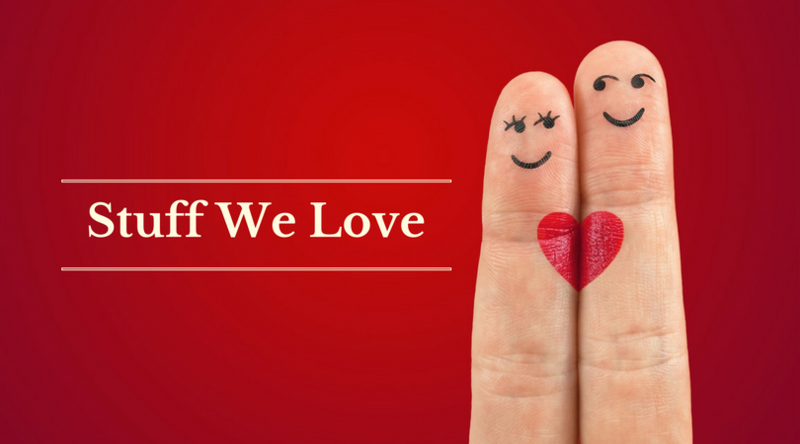 I\’d love to hear how you\’re making out! Come back again and fill us in! First off, I love this site. 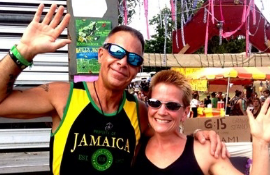 My wife and I recently purchased an older mobile home. We are looking to remodel and you have given me some inspiration. I love the look of the pine walls. I have a few questions. 1. Did you remove the popcorn from the ceiling? 2. For the walls. 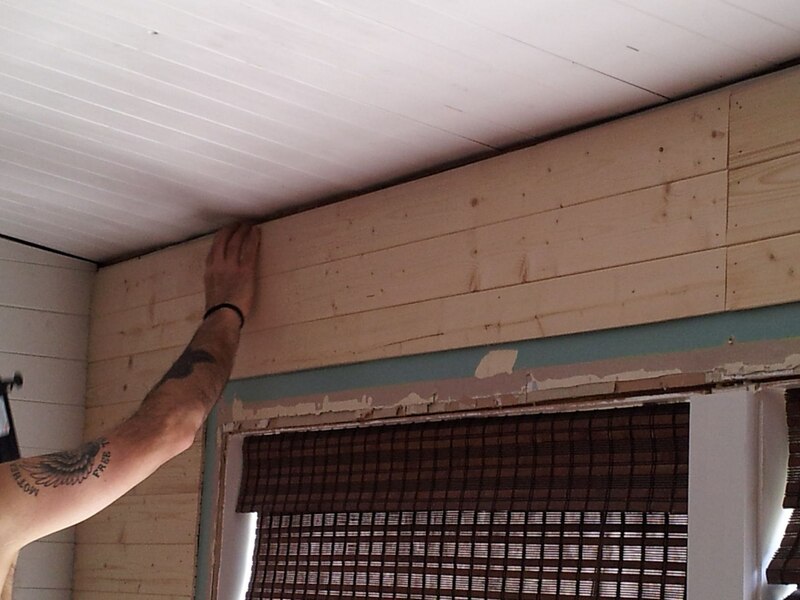 did you remove the walls before installing the pine, or did you just nail it into the board? Hi Court. Thanks for visiting our site and commenting. 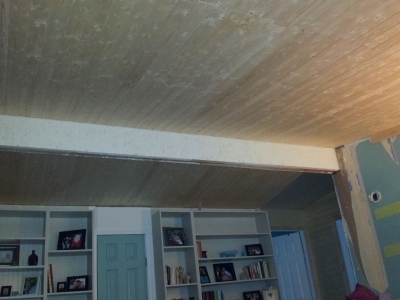 We didn\’t remove the popcorn ceiling but we did dry scrape it with a shop vac so it was a bit smoother. We did this because we figured the popcorn would offer another layer of insulation in the ceiling if we left it there. 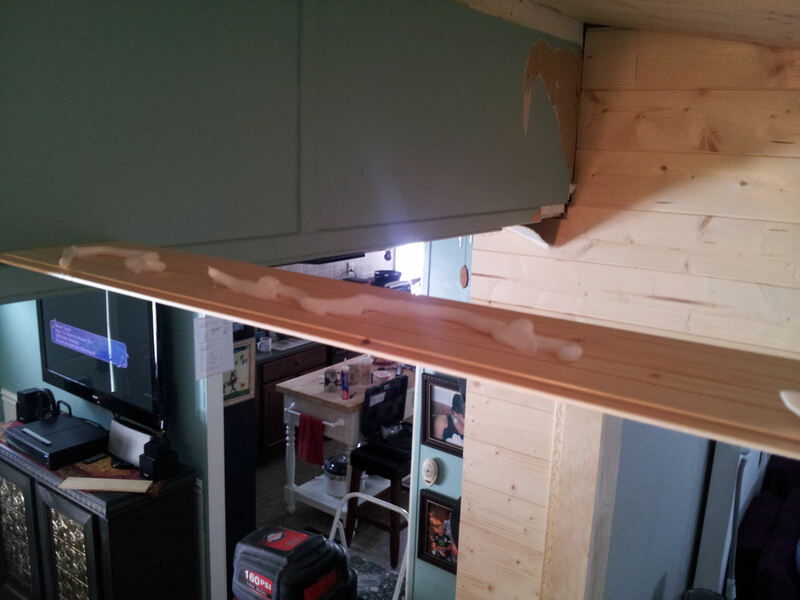 It didn\’t impede our ability to nail the pine to the ceiling at all. 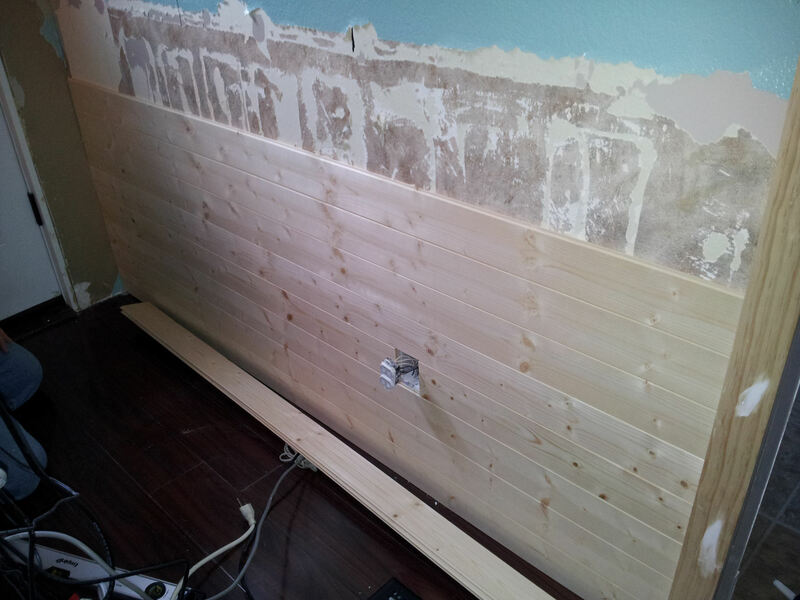 We used loctite construction glue first and then used a nail gun to nail it up securely. We did not remove the wall board before putting it on the walls either. 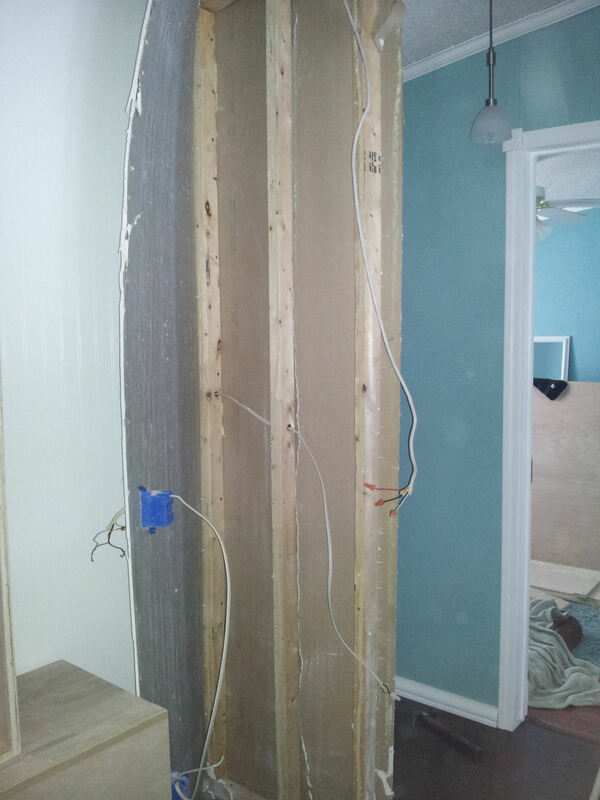 We put everything right over top of the existing wall board. 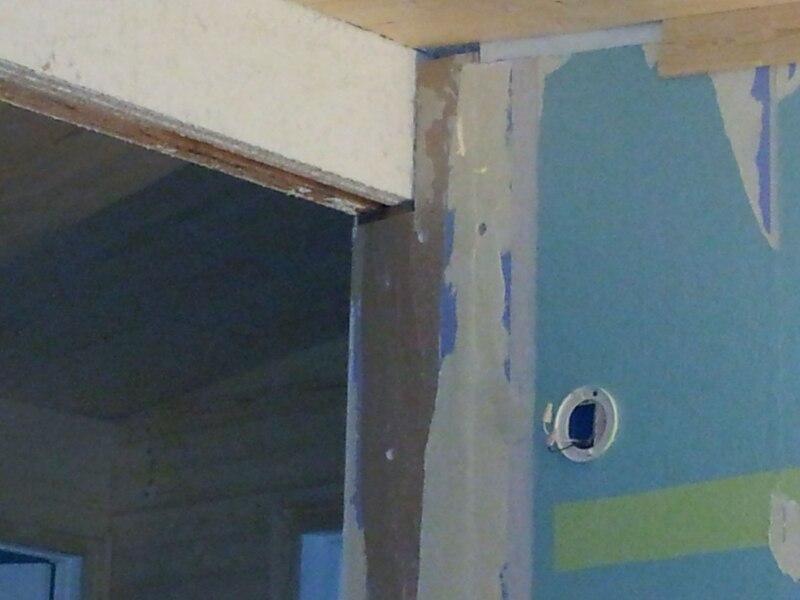 This was gypsum and very thin anyway as our home was built pre-1995. We LOVE this room and while it was a lot of work, it was well worth it. It\’s my favorite room in the house! 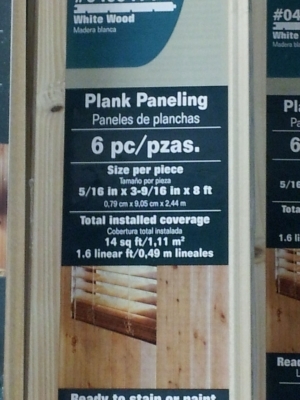 The pine we used from Lowes was really excellent and easy to work with.